FILE: The Facebook icon is seen on a phone screen, Aug. 3, 2017. With nearly 2 billion users, Facebook's survival depends on people continuing to use its service. That's why observers were surprised by an unusual company blog post Friday that highlighted some of the potential harm of using the social media service. the company cited studies that suggested some of the possible downsides of using social media. In one study, people who passively read about others' lives reported feeling worse about themselves. One possibility is "negative social comparison" when reading about others online, the company said, because "people's posts are often more curated and flattering" than how they are in their real, offline lives. But there's a potential solution, according to Facebook, which reported $10 billion in revenue — its highest ever — in the last quarter: Don't be a bystander to others' lives. Use Facebook more and with friends and family. FILE - A user gets ready to launch Facebook in North Andover, Mass., June 19, 2017. Facebook users who spend more time on Facebook — actually post and interact with close friends — experienced more positive effects, according to a company study conducted with Carnegie Mellon University. "Simply broadcasting status updates wasn't enough," the post said. "People had to interact one-on-one with others in their network." The Facebook post came as some former top executives have spoken about Facebook's potential negative effects on society and individuals. 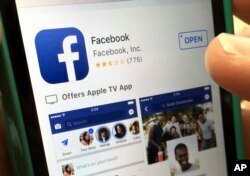 Facebook exploits a "vulnerability in human psychology," Sean Parker, Facebook's founding president, said recently. To aid in supporting people's well-being while using its service, the company recently tweaked its News Feed — what people see when they sign on — to promote friendships and demote what the firm called "clickbait headlines." Also, it launched a new feature called "Snooze" that lets a user hide a person, Facebook page or group for 30 days without having to "unfollow." It gives a Facebook user more control of what he or she sees, the company said. The company acknowledged that people are worried about the short- and long-term effects of Facebook use on young people. It pledged $1 million toward research to "better understand the relationship between media technologies, youth development and well-being." Observers praised the company for acknowledging that using social media may have unintended, negative consequences, but noted that it was unusual for a corporation, one that typically presents itself as a force for good, to point out some of the risks of using its service. One unanswered question is whether Facebook with new features and tweaks can offset potential negative effects. Or will people put a Snooze button on Facebook?